Well I know I have lived just a wrinkle of my life, and I hear so many times it'll be over if I blink twice. In the course of several months, Run River North went from playing a handful of hometown shows in Los Angeles to performing to an audience of millions on late-night show Jimmy Kimmel Live! It was an explosive trajectory for the sextet, whose uplifting anthems march to the beat of drums, jangling guitars and a rapturous string section. The rapid ascent from obscurity launched a new chapter for the band (then called Monsters Calling Home), whose upcoming full-length self-titled debut ventures further into effervescent rock anchored with a down-home aesthetic. On the self-titled debut, the songs ebb and flow with optimism, traversing emotional and musical landscapes woven into the strings duo of Daniel Chae and Jennifer Rim, alongside the galloping rhythm section of bassist Joe Chun, keyboardist Sally Kang and drummer John Chong. Together, their voices coalesce as one, a chorus calling out with a gentle urgency. The music of Run River North explores the ever-shifting search for self, from the energetic indie-rock interludes to the lonesome guitar strums, always asking the question: Is home a place or is it the people in your life? 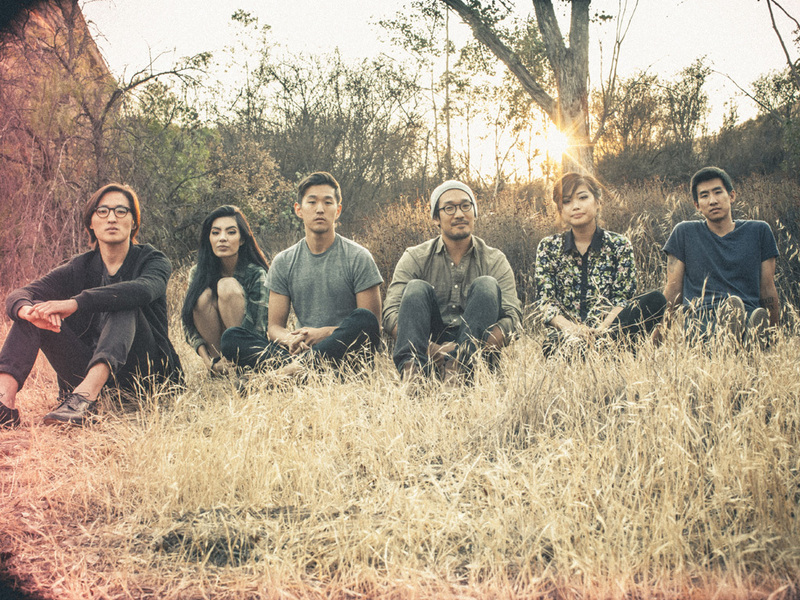 “We’re not a posh, polished pop sound,” says Alex Hwang, Run River North's singer/songwriter. “We have stories we want to tell and they take a little more time. After all, the journey to find your place is a long one, it’s an ongoing, evolving adventure.” The personal stories of the band members are as compelling as the songs themselves. Hwang and his band mates all came from families who moved to Southern California from Asia, and he says that the album reflects their shared search for a sense of home. "The immigrant experience is unique, but our songs also address that universal struggle for identity,” Hwang says. "We wanted to write about it and share the stories about being 'dash American.'" Hwang's lyrics often reflect the earliest folk heroes, whose narratives broach themes of hope, struggle, and the courage to carry on. "For immigrants who come here whose degrees don’t work here and they don't speak the language, many have worked at liquor stores or Laundromats, which a lot of our families did. Then you raise kids who grow up here who look at their American friends and wonder why they don't have those kinds of lives. The song “Monsters Calling Home" is about immigrant parents and their search to make the ‘American Dream happen.’" The bombastic chords of the song hold up Hwang’s powerful voice, relaying the hardships of "digging for worth under a foreign sun." On "Growing Up," acoustic strums commingle with sweeping violins, as Hwang sings about a man who realizes that “home is who you give your love to and your time to.” That somber track “Lying Beast” is a classic prodigal son story, based on a melody from an ancient Korean folk song, about unrequited love between a couple on a mountain pass. “It has message of longing for something that you think is home, but you're not sure how to handle it when you see it,” Hwang says. The overlap of Asian and American folk is subtle, reflecting the hyphenated existence of the band members. “We didn't want to be a K-Pop band; they do it so well, but we’d be terrible at it,” Hwang jokes. Like so many adventures, the troupe's own journey began in a car. In 2012, the cash-strapped band decided that instead of expensive studio space, they would record a song entirely inside of their Hondas. "In the beginning," says Alex Hwang, "we were recording a song every month and making a video for each song. Then we thought, 'what would happen if we recorded an entire song in our cars?'" The simple experiment filmed in those cramped environs became a viral sensation, as their song "Fight to Keep" spread across the Internet. The people at Honda noticed and invited the band to perform at the executive offices. Then, the truth emerged. Instead of playing for Honda, they were booked as the musical guests on Jimmy Kimmel Live! "We had no idea," Hwang says. "We thought that we would just play for Honda executives. It was surreal, since we were going on in two hours, we couldn’t even process how to be nervous, so we just played the best we could." The surprise performance charted a new course for the band. From their gritty beginnings on tour -- where Hwang says they'd sell burned CDs and crash at the homes of gracious audience members -- to now selling out Los Angeles' legendary venue, The Troubadour. Run River North self-titled debut was released on February 25, 2014 via Nettwerk Records.